Preheat oven to 160C. A rectangle cake pan or 8 inch square pan, lined all sides up. Cook (A) butter and cooking chocolate over low heat till melted. Remove from heat and set aside to cool. Add in (C) self raising flour and (D) walnut and green apple, mix well incorporated and pour into prepared cake pan. Bake in preheated oven for 40 to 45 minutes (I only baked 35 minutes) and leave cake to cool. 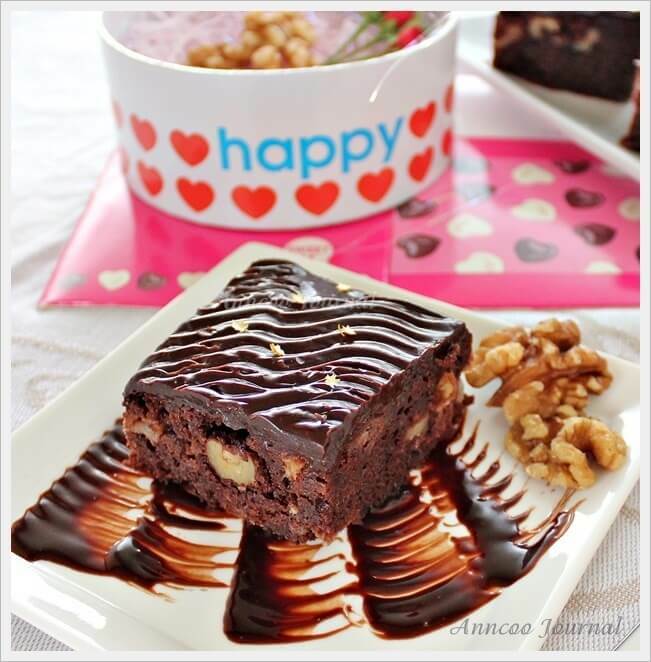 Best to chill brownie for at least one hour for easy spreading of ganache cream. Chocolate Ganache: Light boil whipping cream at medium low fire and add in the chocolate pieces and blend well till chocolate melted over a double boiler. Let cool and spread onto cake. You may apply to 2-3 layers of ganache cream if want a thicker chocolate cream. hi ann, besides the brownies, i also adore how you make that choc patten on your plate..it matches with the ganache swirls on your brownies! Ann, I love your new header. Looks great! Hi Ann, really admire your fabulous skill! My family loves chocolate brownies in all forms! I have to make it once every 2 weeks for them. I love the chocolate ganache on yours. WOW! Your family is really a chocolate lover. 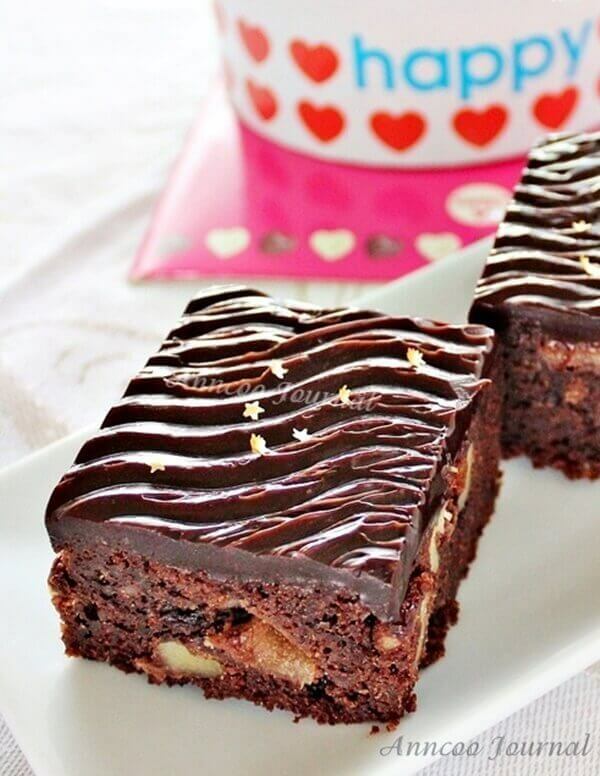 So must bake this, I'm they'll love this brownies too. Angie, hahaaa… you can have all the calorie too because you've been taking all healthy bread lately and remember pass me some too. Ann, this looks sinfully good, really hope can have a slice now! Jess, lets swap for your Nutella cake. Looks very good too. This has got to be the best looking brownies I have seen so far. I love the apples and walnuts you have added in the brownies. The chocolate ganache looks wonderful too. Thank you Biren. You can bake and share this for Christmas holiday. Love the new header, Ann. Very nice :). These apple brownies sound fantastic. I must baked a simple chocolate cake today and felt that its missing something, was thinking maybe apple would do the trick. Am going to try this asap, my hubby loves brownies. Thanks for sharing! Thanks Esther! Looking forward to see your post soon. I love brownies, especially those with plenty of nuts. Want to try this out! Apple in brownie, sound refreshing ! Oh boy – these are dangerous!! Ann, whoa! What a great treat, I love these brownies. Will bake this weekend! Mich, then you must try this brownie. You'll 'WOW' after trying it. Sashy, you can use any kind of nuts to make this brownies. Firstly, I notice that you've created a new header. Love it, simple and cool. Then comes the Brownies…..drooling. I can do with at least two! Hello, Ann! 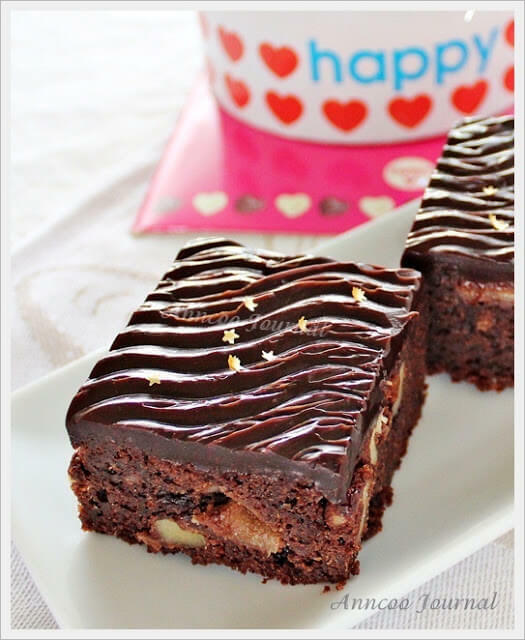 The wavy pattern in your brownies have made them so special! I can see that they are very moist, looks really good there! Jessie, I like your fresh noodles too. Very pretty colour and healthy too. These both looks and sounds delicious! Oh Ann, these brownies look so good. I am going to make this when Diana come home for Thanksgiving. She is crazy over brownies. Thanks for sharing. You're welcome 🙂 Hope Diana will enjoy this too. Brownies are always a favorite around here Ann! I can just imagine how good these are, I would love one of your brownies!! Hi Lyndsey, Hope you'll try this at home, I'm sure everyone will love it. Wow what a great treat early in the morning. 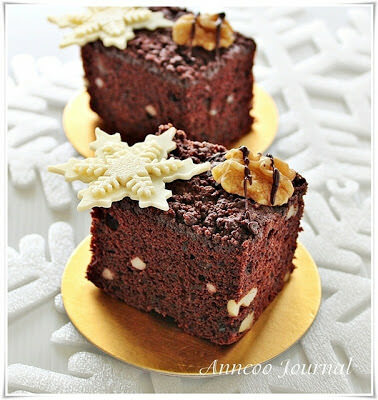 It really looks moist and sinfully rich! Can try this at home, very easy to do.